The International Catacomb Society is pleased to announce open source access to research on the Jewish catacombs of Rome conducted on site over many years by society founder, Estelle S. Brettman. 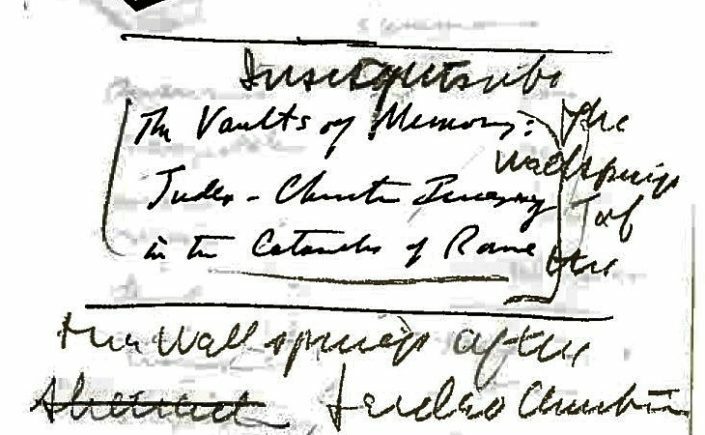 Brettman, who died in 1991, left unfinished her lengthy monograph, "Vaults of Memory: The Roman Jewish Catacombs and Their Context in the Ancient Mediterranean World," but ICS directors Florence Z. Wolsky and Amy K. Hirschfeld continued the project after her death, and parts of the collective work have now been edited, annotated, and digitized by the ICS's current executive director, Jessica Dello Russo, who explains in a preface what seem to have been Brettman's key concerns in the study of Roman catacombs, and why her work, carried out over fifteen years with what a critic called "dramatic intensity", still matters to current scholarship on these sites. As an early supporter of Brettman put it: "the story of Mrs. Brettman and how her project came into being is in itself fascinating, aside from the substantive aspects of the material that came out of the mythic descent into the depths of the earth beneath Rome." "Vaults of Memory" as a monograph was long a priority of the ICS, and calls for its completion have resumed in recent years, after a long hiatus. One current ICS board member even believes Estelle Brettman appeared to her in a dream, asking that her book finally be complete. The possibility of completion at first seemed remote: much of the manuscript was lost, or in fragmentary form, and that which remained existed in multiple versions, undated and marked throughout in red ink. Co-creator, Florence Wolsky, in her early 90's, still spirited but fading, was no longer in a condition to assist with the project, and the other author, Amy K. Hirschfeld, had already published revisions of the material under her own name, realizing Brettman's worst fears of "being copied in many places". Dello Russo's familiarity with the source material for Brettman's text, however, provided direction as to how to shape the work in digital form. With a great amount of current information on the catacombs already on line at www.catacombsociety.org, as well as operational research databases like DAPICS and BiblioSelect, the Brettman study could be contextualized chronologically and even conceptually, testifying to the vivid "shock of recognition" that modern Jews and Christians were experiencing in the last decades of the twentieth century as new publications of textual and archaeological evidence were challenging traditional notions of the development of these "adjacent communities" in Imperial Rome. Brettman's "visual odyssey" rode a high wave of ecumenism, but broke, too soon, against the hard barriers set up by various political and religious factions, forces with power to turn good intentions into failed results. It has been challenging, today, to enter into the mindset of another era, as well as that of individuals with different agendas and experiences in the study of the catacombs of Rome. Like Giovanni Severano's cutting up Antonio Bosio's text of the Roma Sotterranea, the result of course will not meet the original author's expectations. Brettman herself seems to have dreaded not doing so - as a self-described "relative newcomer to the field" - comparing her "life's work" to the elephant in the closet, looming over all other aspects of her existence. Nonetheless, she strongly believed that she had a place in catacomb studies, in the words of art historian Richard Brilliant, "opening the field, so that everyone seems to be jumping in". ICS has adopted the phrase as its guide to the digital text of "Vaults", an open invitation, like that always so warmly extended by Brettman herself, to experience the "communality of religion", indeed, dramatically. Please let us know how you do.